While some of our sabs met with Cirencester Illegal Hunt Watch yesterday to visit the Cotswold near Turkdean, another sab met with Welsh Borders Hunt Sabs and a representative from Outpaced to go to the Cotswold Vale Farmers’ Hunt. Two of sabs had less time to spare this week, so decided to pop along to the Croome and West Warwickshire Hunt both on Tuesday and yesterday for a few hours of motorbike monitoring. Yesterday was due to be the last meet of the season in Peopleton and we arrived on the afternoon to find sheep and lambs running around in roadside fields as horses and hounds ran near or through them. 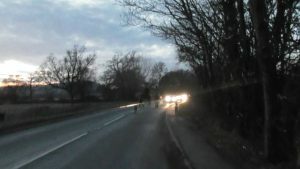 Whilst drawing a covert by a main road two supporters were spotted pointing and raising their hands. Hounds left that side of the covert accompanied by huntsman but struggled to pick up the line well… We followed to observe and as we did so we’re in turn followed by a rider supposedly laying the trail. Behind the hounds? Nothing major going on whilst we were there, apart from some dodgy driving by a supporter and another getting annoyed at not knowing who one of our sabs is. We haven’t spent a lot of time with the Croome these last two seasons, but various locals continue to keep their eyes on them openly and covertly. We’ll be sure to spend more time with them in future seasons too. Wherever you are, keep the info coming and keep doing good work out there too. More people are starting to realise that you don’t need to be part of a sab group to stop wildlife persecution, people checking setts before and after work, walking their dogs or going rambling near hunt meets and keeping an ear out for local info… People are stopping dig-outs, unblocking setts and reporting incidents such as the Croome hounds killing a deer a couple of seasons back. Saturday 11th March 2017, Cotswold Hunt Turkdean. We once again joined our friends from Cirencester Illegal Hunt Watch. It was an early start to check for sett blocking and we found no setts blocked that we checked initially. As can be seen from previous reports this week Turkdean has been besieged by hunts all this week AND this is the North Cotswold cull zone so it was doubly important to keep an eye out for badgers as well as foxes and hares. 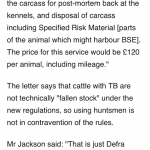 Worth thinking about this for a moment re biosecurity and BTB which we are told is so bad that a government sponsored cull needs to take place. On Tuesday the Heythrop met at Turkdean and blocked at least 6 setts out of those checked. The next day, Wednesday, it was the turn of the Dummer beagles to run around in the exact same area. (nb beagle packs hunt hares and so no need for them to sett block). Today, Saturday, the Cotswold hunt went across exactly the same fields as their mates! 15 setts checked and 2 found to be freshly blocked (by CIHW). One sett had staves rammed down it. So…. hunts and the spread of btb… hounds eat fallen stock and abbatoir bye products, none of which are tested for btb, they wee and poo wherever they want and the huntsman does not have poo bags. Three packs in the same area within 5 days??? Worth thinking about. Then there are all the horses, the sett blockers not disinfecting their quads and spades (as vaccinators and cullers are obliged by law to do), the terrierboys stood on setts to frighten foxes away from the setts that the police have had words about before. All this in an area that is culling badgers and is home to those who called for the cull in the North Cotswolds in the first place!! This really defies logic. Anyway, they spent a lot of time trying to avoid us and running away . 2 sabs went into one covert to make sure that the sett was ok and were greeted by 8 masked up terriermen who said that they had been expecting them. Apparently we go out the day before and block setts just to get them into trouble…. hmmmm projection wethinks! Without evidence of them blocking setts they wouldn’t get in trouble, so if we were blocking them, there would be no useful footage of them doing it. Hmm. Not the brightest bunch! The terriermen did at one stage show us what was in the quad, a drag it transpired. Never saw it out of the box though… 2 of the little boys with them saw to fit to spit at one of us which could have gone a bit wrong considering that they were masked up and of course spitting spreads tb…oh dear! They also surrounded one car in an attempt to intimidate. At Salperton someone blew a whistle (used by some hunts to communicate the sighting of a fox) and they did hunt that one. Otherwise the warm conditions affected scent. They were pretty surrounded all day. They flitted about a bit Turkdean, Aylworth, Salperton and Shipton Oliffe all being visited with us in tow. 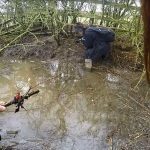 Gloucestershire Police are to be thanked for following up with these badger sett interference offences and doing what they can. It was good to see that setts had recovered from being vandalised by the Heythrop. Wednesday 8th March 2017 Dummer Beagles with Cirencester Illegal Hunt Watch. Yesterday the Heythrop were terrorising wildlife around Cold Aston. Today, in exactly the same place, the Dummer beagles met to hunt hares who live in “forms” in fields so their young, leverets, are at risk as are pregnant and lactating Jills. They did not seem to want to play with us and became very keen to get away from sabs with the followers splitting up and the pack making a very fast exit towards Turkdean. Within half an hour of this subterfuge the pack were in the back of their white transit van and off to goodness knows where whilst bewildered followers milled about. Some decided to follow us about instead which may, or may not, have provided some entertainment – maye we should have demanded a cap fee…? 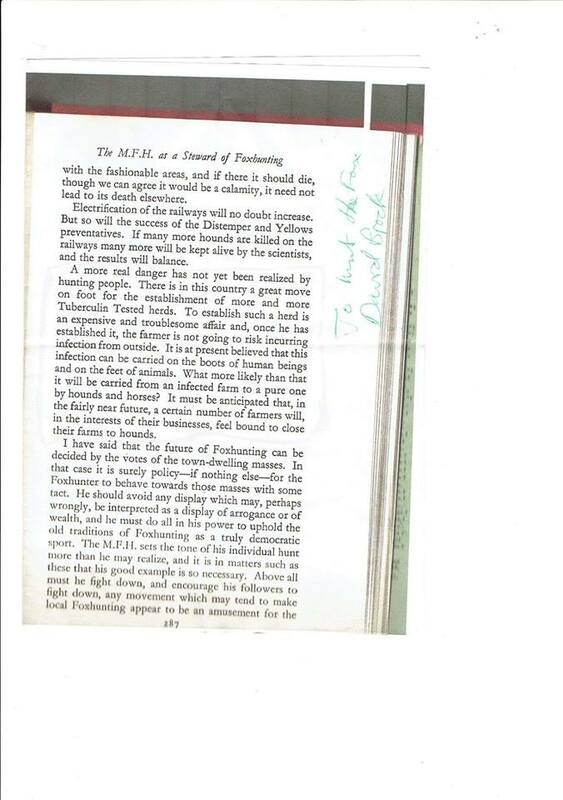 One mounted stalker telling us how the Heythrop hunt a drag… so why do they block badger setts then?? We made good use of the time looking for them checking other setts to see if any more had been blocked. Two others had been and one was on an old rubbish tip full of glass and interesting historical artifacts! Unblocking that sett was like an archeological dig. This is in the North Cotswold cull zone and these setts are at great risk. Recently there have been reports that the Kimblewick Hunt has had to kill some of its hounds due to them catching bTb from a carcass. 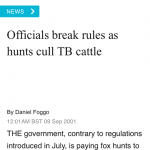 While this has not been confirmed by the hunt or the Masters of Foxhounds Association (the MFHA) we wanted to write a few thoughts about bTb and hunting in general. While it’s believed that it is harder for bTb to be spread through the movement of biological materials such as soil rather than mouth – to – mouth transmission or through the sharing of water troughs, etc. initial guidelines for cull contractors in Gloucestershire stated that they should wash down their vehicles, changing clothes and boots when moving between farms. Check out ‘Stop Badger Sett Blocking’ for various incidents of sett blocking at / near hunt meets. 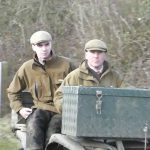 We are approaching a time when many hunts are finishing the season in their areas and are heading to the Fells, the West Country or the South in order to get a few more meets in before the fox hunting season comes to an end. Throughout the season hunts will travel around the country for joint meets with other hunts, taken horses, hounds and vehicles with them before returning to their own country… What better way to spread disease? Especially as the badger culls in this part of the country cover various parts of all three counties, and cover various ‘hotspots’ of the disease, it’s incredible that culls are being allowed to carry on and that new licenses are being granted for it to move into further areas. 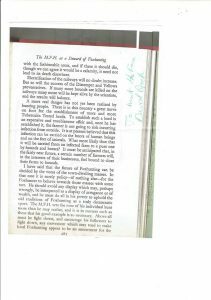 Badger vaccinators are required to wash down their boots and disinfect, so why are the guidelines for cull contractors not so strict and why do the hunts get to move around unrestricted? Badgers are being targeted illegally by badger baiters, diggers and farmers, are caught up in the hunting of foxes when their setts are blocked or dug-out by hunt staff and supporters and are being scapegoated by farmers and the government in the ‘fight’ against bovine tuberculosis. A week before last year’s cull started in Gloucestershire a 3C sab and her friend caught a group of badger baiters at a well-targeted sett from the cull that they were keeping an eye on. In February 2016 a man was caught prior to a hunt meet in the soon-to-be North Cotswolds zone blocking a badger sett. October 2016 saw a hunt terrierman in the Cotswolds digging out a badger sett to get to the hunted fox. 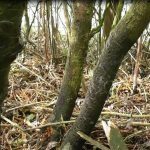 These types of incidents previously led us to write our article ‘Hunts vs Badgers’ in order to highlight the persecution of badgers in the three counties / badger culling zones. How can badger culling continue to be licensed when activities such as hunting continue unresearched and unregulated in those very same cull zones? 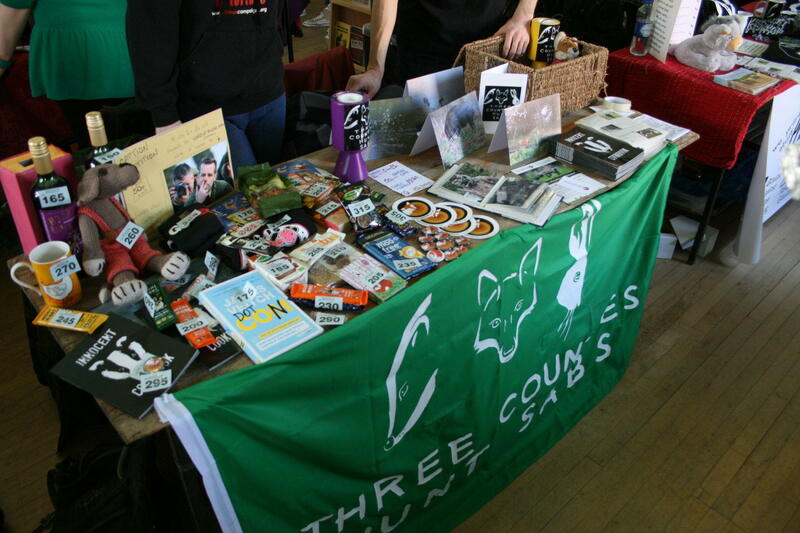 Great day out yesterday at the Evesham Vegan Fair with some awesome people running our neighbouring stalls. Great to meet new people and chat about the hunts and badger cull. Big thanks to everyone who donated money and / or bought t-shirts, mugs and cards – all money raised goes directly into helping wildlife! Finally getting some old films up which were pending legal stuff… More to come. 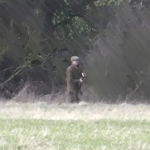 This was filmed at the final meet of the VWH on 2nd April 2016 working with Cirencester Illegal Hunt Watch. 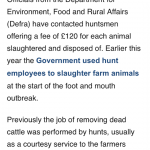 Bear in mind that many hunts will continue to hunt into April. Fox cubs are already being brought into wildlife rescues. Heavily pregnant and lactating vixens are being hunted. Please help us to continue to protect wildlife paypal.me/threecountiessabs and thankyou for all the support! Today we attended the Ledbury meet at the Elms school in Colwall. The school sends the children who study there out hunting as part of their physical education… which is an, ermmm, interesting choice especially with the amount of decidedly dodgy activity we have seen the Ledbury engage in… dig outs, blocked setts, assaults on sabs, reports from farmers /others of trespass, hounds on main roads, illegal hunting and so on and so forth. They then decided to pop over to Castlemorton itself (into land where the wardens have no jurisdiction) and lurk near some badger setts under the watchful eye of foot sab who was told that her safety could not be guaranteed from 2 tiny podgy-looking terriers. She coped admirably, no funny business at all. Back to Castlemorton Common where the wardens once again continued their watch. Eventually they popped over to Welland and drew blank and on finally to their favourite the Stanks where not much happened either. Several setts checked but none found blocked. Pack up at 17.00 but a quiet day for sabs. 24th February 2017, Bicester with Whaddon Chase, Home Farm Poundon. We don’t often get to this hunt but as the Bicester Boys came out with us at the Ledbury Hunt last week we thought that we would return the favour. Normally the Hunt Monitors get out into this area – give ’em a like and a share on their page! The hunt drew first over the live railway line north of Poundon and seemed to want to get away from us. On the Poundon to Stratton Audley road we heard hounds speaking and some escaped sheep munching on winter wheat. Thinking that hounds may have been marking to ground, we went inland and spotted one of the terriermen on his phone, spade in hand… he ran away and jumped on the quad to escape when he spotted us. Smelling fox in an area along the hedge he had been in, we investigated and found a water filled ditch with bright red lumps floating on the surface. The immediate area was flattened with hoof prints, hounds prints and boot marks nearby. 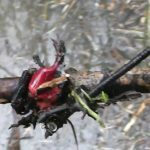 We entered the water to examine the lumps which turned out to be blood clots, what looked like trachea and lung and the tell-tale red and white fur caught up in the brambles. Drops of blood were also found on the bank opposite. Fencemenders (including our old ‘pal’ Danny Burton) were fixing fences in the next field, which the hunt had damaged during the chase. Bicester Boy Tom arrived late in the day to try and have a go… wonder if he’d gone to the Ledbury this morning to see us? Thames Valley Police attended the scene very quickly and we would like to thank them for their professionalism. 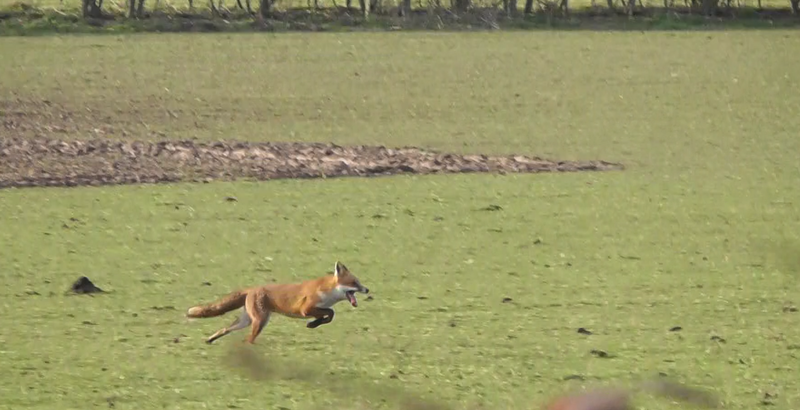 Whilst looking at the carnage, they told us that the hunt had informed them it was an accidental kill. We reviewed the footage and there is a lot of encouragement going on from the huntsman… perhaps he should ensure he’s not chasing live foxes before doing so in future?! 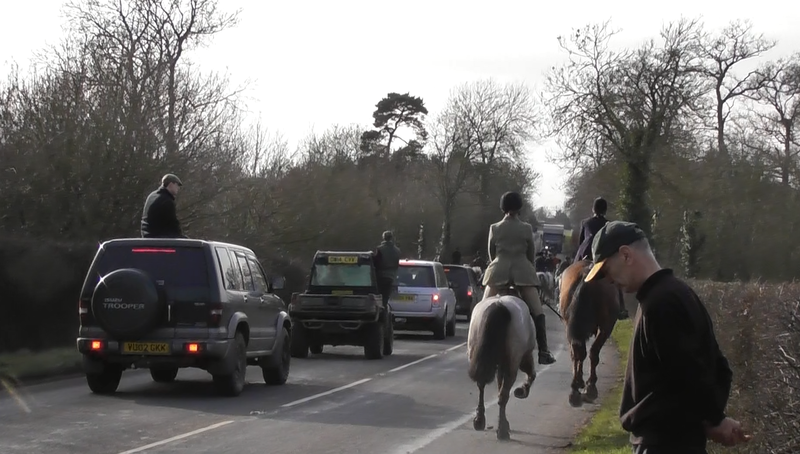 The hunt continued north of Stratton Audley and stayed out until it was dark. A loose hound was found on the road by one of us and returned to the hunt (without so much as a monotone ‘cheers’). We’re aware of another fox being chased during the day and who managed to successfully get away with some help… but that’s another story! Other sabs attended the Ledbury Hunt from midday onwards (so if dear Tom, the Bicester Boy, was a-visiting, he’d had left to come see us just before their arrival) and spent the afternoon in Hasfield, Ashleworth and Maisemore with them. They met near the Bridge Inn, which has held a number of South Herefordshire meets in the past, in the village and hunted the woods behind Michaelchurch Court initially. It was a pretty warm day out in the open and much of the time they drew blank. At one point, up on the hills, about 8 hounds came running towards us on a line, so we called them up out of the trees, away from the fox who we believe went to ground nearby, and into the open part of the field, surprised that no hunt support were encouraging them on… then we realised that no hunt staff were anywhere to be seen. Or heard. 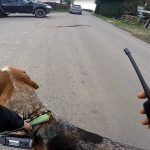 We spent some time trying to keep hounds out of nearby fields of sheep – it was in South Herefordshire Hunt country that the SHH hounds killed several sheep just a few seasons back. On the way back down the hills soon after (sab driver had been in touch to say she had spotted huntsman with about 3 hounds in tow down on the road…) we had loose hounds running around in various fields, still no other hunt staff in sight. Into a valley and up on to another hill and we watched as the pack split on 2 separate lines, hunt staff and riders making a choice and riding off with one half of the pack, abandoning the others speaking in woodland a few fields back. Needless to say, the pack are supposed to be hunting as one. Even when the hunt were ‘in control’ of (almost) the entire pack, it seemed all on horseback were to be involved… Any good huntsman should be able to keep his hounds together with the odd horn or voice call, whippers-in doing their job by stopping hounds straying from the rest when being held up. With this hunt it appeared that the (over-)use of holloa’s was the preferred method, most riders whooping away excitedly for more than a minute to attract stray hounds (mostly unsuccessfully it should be added) whilst other riders rode off at speed, having allowed stray hounds to get a decent head start, rating and whipping madly to stop them. Hunt support informed us that the hunt rarely catch anything and explained that the 3 vehicles and handful of riders was about right for one of their meets. Much of what we saw today is a complete contradiction of what we’ve previously been told about the hunt. So we’ll be sure to come back again before we form a proper judgement. We hope that all sheep in the area are OK after the hunt’s incompetency in keeping any vague element of control over the pack today… A little worrying to see huntsman Darren Foxley looking happy as Larry at the idea of having 3 of his hounds paying attention to him! So it was to be one of the first times we would see the Ledbury hunting in Forthampton Estate as the shooting season has only just finished. And then we found out that we were to have the added pleasure of the Warwickshire coming over for a joint meet. Will Goffe, huntsman for the Warwickshire, moved to the hunt from the Ledbury a few seasons ago, leaving us with Mark Melladay. Goffe knows the area well and went straight into his usual hunting technique of letting the hounds go and then riding vaguely nearby whilst they hunted on. He marginally escaped an illegal hunting charge just before his departure after footage was filmed throughout a hunting season by members of 3C and West Midlands Sabs, so it would be interesting to see how he’d act around us now. Part of the way through the day, hounds picked up right by the A438, a busy road that many will know from the Gloucestershire badger cull, going into full cry from Voulter’s Wood and along the hedge line before crossing the A-road (which was now packed with riders, car support, horse boxes, an uninsured and overloaded quad bike and several locals and ‘normal’ road users caught up in the midst). 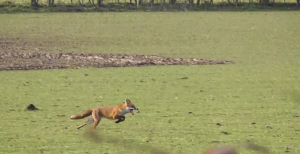 Fox was filmed running back towards Sarn Hill, hounds right on his line, but our priorities lie in stopping the chase. We held hounds up for some minutes before they crossed into the covert the fox had gone into, again right next to the A-road, and one sab was shoved around by an angry Chris Bowers and friend. If you’re going to push sabs and then try to justify it by saying they’re trespassing Chris, don’t shove them when they’re on roads and footpaths as well or where’s the incentive to remain on public land? Some time later and hounds were gathered safely, 2 sabs following towards Tirley while a third chased down the quad bikers who had headed towards the motorway after the hounds had chased the fox there. With sabs having Bicester Boy company, we think they warned the hunt that the sab was looking for terriermen as the quad moved off and rejoined the hunt as she got near. Who knows… They know we’re thorough at least! Hound and hoof prints and quad tracks headed for log piles in a wood by the motorway. With Robin Smith-Ryland second-horsing just before 3pm we knew we were in for a standard Will Goffe extended day. Sab in Tirley was sitting quietly and listening for the hunt and a fox broke cover, almost coming face to face with her but not breaking his stride. Hounds picked up nearby, but she had thoroughly covered his line which slowed them down on the scent. A huge circular chase ensued just a few minutes later with holloa’ing, whips and smelly farmyards breaking up the chase here and there, but as we headed towards Haw Bridge as the light faded and hounds sprinted on, we feared the worse for the hunted fox who would now be exhausted. Splitting up, one sab ran inland (where a fox was chased to ground a few seasons back) whilst others covered a nearby track and the main road (where we’ve had to slow traffic down to avoid hunt casualties in the past). In the twilight, hounds were running around in a thin strip of scrub next to the road and on the road itself, but we rated them as they checked… Goffe wasn’t grinning manically and seemed tempted to encourage them to carry on hunting, so it certainly seems that the fox had managed to make his escape somehow with a little help now and then from us. The hunt finally packed up and headed for Townstreet Farm just after 6pm! We weren’t with them all day and we had eyes on the terriermen intermittently, so, as always, there are no guarantees… But we know that some foxes made their way to safety whilst the hunt managed to make themselves look like the arrogant bullies they are when it comes to ‘insignificant’ things like, say, road safety and basic manners. Was interesting to have Will back in the area for the day and to find out what’s it’s like to be outnumbered about 100 to 1, but we’re ‘looking forward’ (so to speak) to business as usual again on Monday. Support us if you can by sharing our posts and / or donating at paypal.me/threecountiessabs Thank you!